Product prices and availability are accurate as of 2019-04-11 14:38:09 EDT and are subject to change. Any price and availability information displayed on http://www.amazon.com/ at the time of purchase will apply to the purchase of this product. ï¿½ Wingspan: 13.65"ï¿½ Length: 12"The Hughes TH-55 Osage was a piston-powered light training helicopter. The original model was the Model 269 and was initially designed as a fully glazed cockpit with seating for two pilots, or a pilot and passenger, it also had an open-framework fuselage and a three-blade articulated rotor. The prototype flew in October 1956, but it wasn't until 1960 that the decision was made to develop the helicopter for production. The original truss-work tailboom was replaced with a tubular tailboom and the cockpit was restructured and refined prior to being put into production. 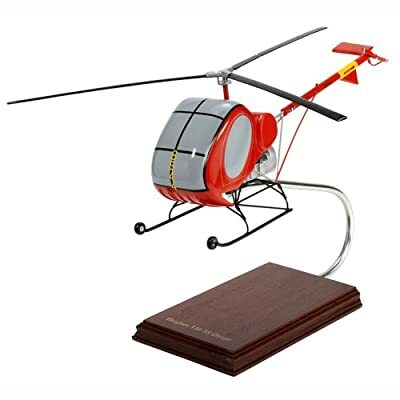 With this model Hughes successfully captured a large portion of the civilian helicopter market with an aircraft that would prove itself popular in agriculture, police work and other duties. After the design changes, deliveries of the Model 269A version began in 1961. By mid-1963 about 20 aircraft were being produced a month and by the spring of 1964, 314 had been built.This specific Model 269 is the TH-55, used by the Army. In 1964 they adopted the Model 269A as its training helicopter to replace the TH-23 and designated it the TH-55A Osage. A total of 792 TH-55 helicopters would be delivered by 1969, and it would remain in service as the Army's primary helicopter trainer until it was replaced in 1988 by the UH-1 Huey. 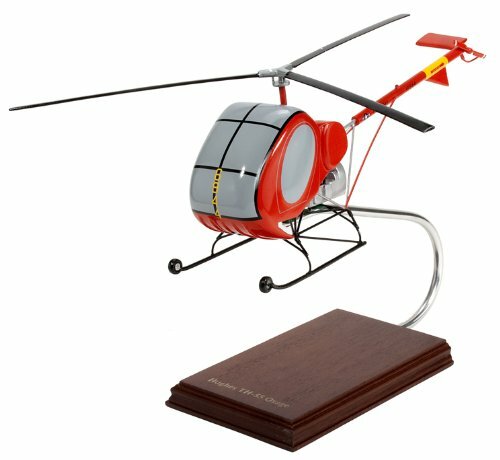 At the time of its replacement, over 60,000 Army pilots had trained on TH-55 making it the Army's longest serving training helicopter.This handcrafted model is painstakingly built from Philippine mahogany by our skilled craftsmen with a wealth of detail and makes a great gift for any veteran, aviation enthusiast or history buff.